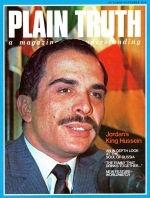 After a delay of seven years, King Hussein of Jordan and I enjoyed our first personal meeting. It was - at least so it seemed to me - just as if we had been life-long friends who had not seen each other for seven very, very long years. I had read His Majesty's autobiography, and it seemed as if I had always known him. When he learned that I am now working on the final four or five chapters of the second (and final) volume of my own autobiography, he asked if he might not have the very first autographed copy. I spent a wonderful week in Jordan in late June. Besides a most interesting and enjoyable meeting with His Majesty the king, I had a personal meeting with his younger brother Crown Prince Hassan and a good portion of a day with another brother. Prince Mohammed, who accompanied us on a flight to Aqaba.